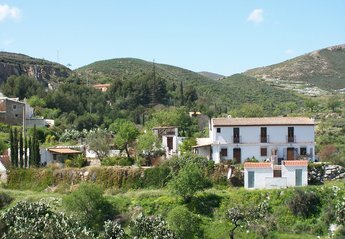 Detached two bedroom cottage with private pool on 2 acre Andalucian Finca and within 5 minutes of authentic Spanish white washed village. Al Andalus is a development in Puerto Rey, Vera, Costa del Almeria, built in the attractive Andalucian style. One bedroom apartment with shared swimming pool. Lovely villa at Desert Springs - sleeps 6-8, with a fantastic position overlooking the 1st and 18th fairways of the exquisite Indiana golf course. Luxury Apartment Facing Golf Course And Mountains. Central. Wifi. Facing Almerimar golf course/Sierra Nevada mountains. Well stocked reasonably priced supermarket is 2 minutes walk away. Wide range of Bars/restaurants and 2 beaches 5 minutes walk. Large pool nearby. Ideal for a sun , beach and fun holiday. This luxerious apartment has 3 bedrooms, a large living room, terrace with sea view, access to beach. 2 bed, 2 bath luxury penthouse. Private balcony overlooking the ocean plus giant upstairs private terrace w barbeque and sundeck. Sea and mountain views. Gardens w 3 pools, gym, jacuzzi and tennis. Reef Cottage. Tranquil And Relaxing Location. Rural Farmhouse Cottage in Cariatiz, (Sorbas), Nr. Mojacar, Almeria, Andalucia, Spain - Beautiful, Tranquil Location, Outside Dining Areas, Ideal For Breakfast In The Warm Morning Sun. Luxurious Sea Viewing 3 dbl bedroom beautiful holiday apartment. Huge terrace with large dining areas overlooking the gorgeous and stunning Mediterranean Ocean and Beach. Beautiful 3 bedroom apartment with gorgeous Sea and Mountain views.
" EL MONTECILLO " Beachhouse / Villa on the beach near Almerimar. With impressive and lovely views over the Mediterranean.